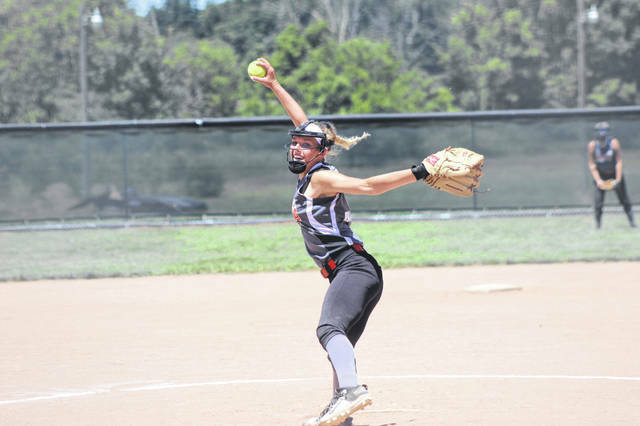 Ansonia’s Lauren Burns throws a pitch during the 7th/8th Grade Girls Cross County League Softball Tournament championship game on Sunday at Lady Wave Stadium. The Tigers lost to Greenville 4-3. Ansonia catcher Aubrey Noggler goes up high to snag a pitch during the 7th/8th Grade Girls Cross County League Softball Tournament championship game on Sunday at Lady Wave Stadium. Ansonia lost to Greenville 4-3. 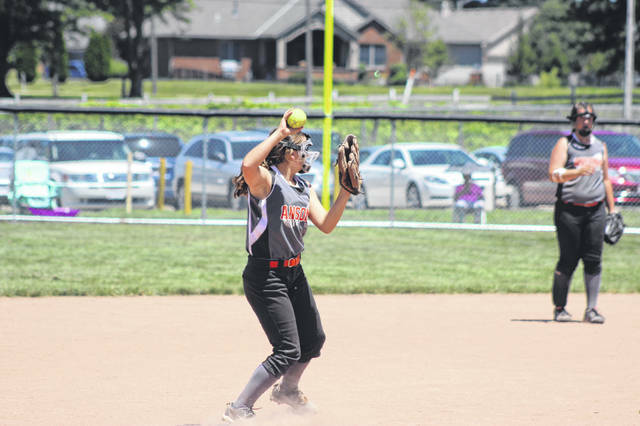 Ansonia shortstop Kinsey Hartzell (54) picks up a ground ball and fires to first for an out on Sunday during the championship game of the 7th/8th Grade Girls Cross County League Softball Tournament at Lady Wave Stadium. Greenville defeated Ansonia 4-3 to win the title. 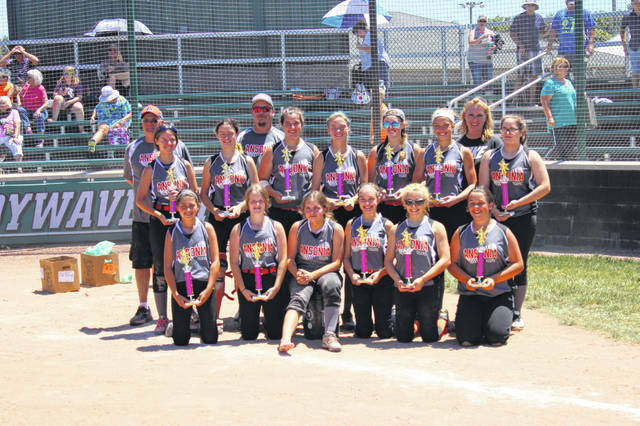 The Ansonia team finished as tournament runners-up on Sunday after losing 4-3 to the Greenville #1 team in the 7th/8th Grade Girls Cross County League Softball Tournament championship game at Lady Wave Stadium. 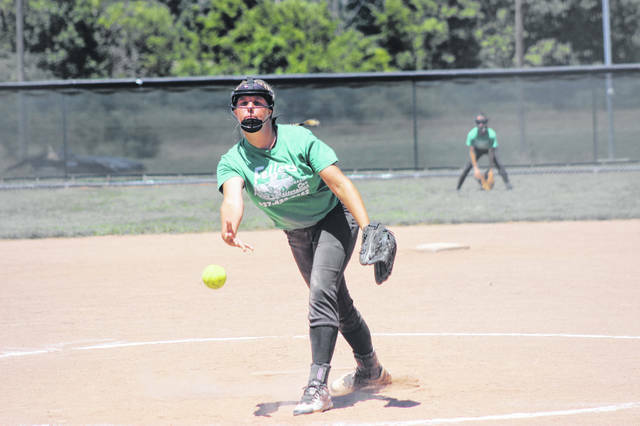 Ansonia lost its second game of the tournament on Friday and fought all the way back with five consecutive wins in the loser’s bracket to reach the championship match. 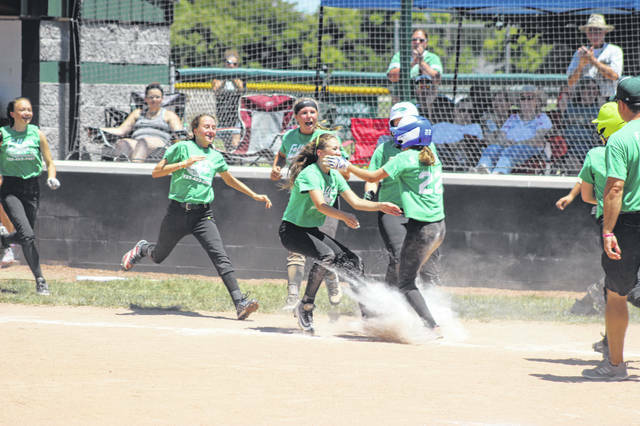 Sage Fellers (22) celebrates with her teammates after scoring the winning run in the bottom of the seventh inning on Sunday in the 7th/8th Grade Girls Cross County League Softball Tournament at Lady Wave Stadium. The Greenville #1 team defeated Ansonia 4-3 for its second straight championship. 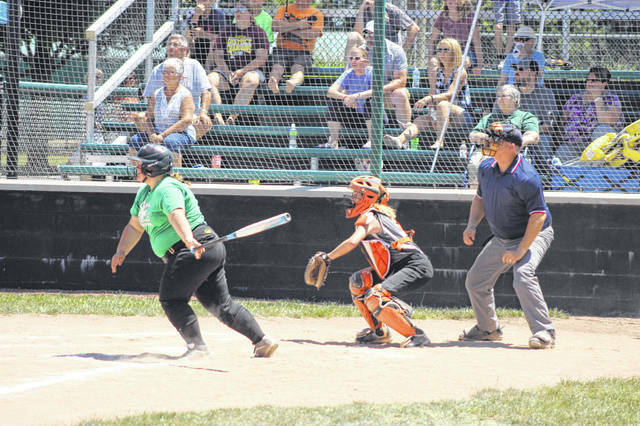 Bracy Swisshelm (24) gets a bases-loaded hit to right field that scores two runs in the third inning Sunday to put her team in the lead 2-1 against Ansonia in the championship game of the 7th/8th Grade Girls Cross County League Tournament at Lady Wave Stadium. Suzi Blocher throws a pitch for the Greenville #1 team in the 7th/8th Grade Girls Cross County League Tournament championship game on Sunday at Lady Wave Stadium. Greenville defeated Ansonia 4-3 to win its second straight tournament title. Greenville shortstop Sage Fellers snags a low line drive off the ground for an out and then fires to first base to double off an Ansonia baserunner for an inning-ending double play on Sunday in the 7th/8th Grade Girls Cross County League Softball Tournament at Lady Wave Stadium. GREENVILLE – When her team needed her, Sage Fellers came through. 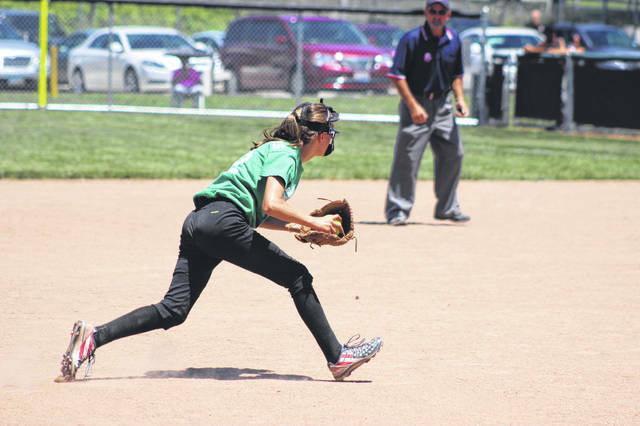 With the 7th/8th Grade Girls Cross County League Softball Tournament championship game tied 3-3 in the bottom of the seventh inning on Sunday at Lady Wave Stadium, the incoming GHS freshman led off the inning with a single to right field. But the aggressive base runner saw an opportunity to make something happen and she did just that by stretching that hit into a double thereby putting herself in scoring position with no one out. Fellers later stole third base and then with two outs in the inning scored on a wild pitch for the game-winning run. She immediately celebrated with her teammates who came pouring out of the first base dugout. It was a nip-and-tuck game all the way with Ansonia taking an early 1-0 lead in the second inning. Kristine Shaner doubled to lead off the visitors top half of the inning. Alyssa Noggler sacrificed her to third and she scored the first run of the game on an RBI ground out by Denay Geesaman. But in the bottom of the third the Greenville team mounted a rally by scoring twice for a 2-1 lead. Brianna Fellers began the inning with a strikeout, but when the ballwas dropped she scooted down the line and was safe at first. Sage Fellers then walked and Suzi Blocher was intentionally walked to load the bases with no outs. One out later, Swisshelm singled to right field scoring a pair of runs for a 2-1 lead. Two innings later in the bottom of the fifth, Greenville added to its lead when Skylar Fletcher scored on another RBI hits by Swisshelm. “Bracy had a big hit for us early in the game to give us the lead,” Coach Fellers said of Swisshelm. “She’s been hitting the ball really well lately so I was excited for to come up with the bases loaded. She’s a good kid and really works hard. I’m really happy for her. But Ansonia wasn’t about to just give up. The Tigers had already fought all the way back through the loser’s bracket just to reach the championship match. 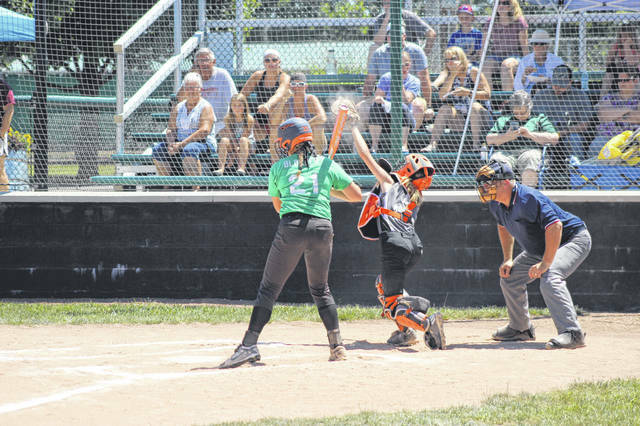 After losing their second game of the tournament on Friday night, Ansonia won five straight games to reach the finals including three games all on Saturday. Trailing 3-1 in their final chance, the Tigers scored twice in the top of the seventh inning to tie the game 3-3. Lauren Burns had a one-out single. She stole second and went to third on a passed ball. A Meghan Brown RBI single scored Burns to make it 3-2. Then with two outs and runners on first and second, Abby Barber singled to score Brown tying the game at 3-all. But the Greenville team held off any further scoring by leaving two Ansonia runners stranded. “It was a great game,” said Ansonia coach Cory Barber. “It is disappointing but these girls left everything they had out on that field and I couldn’t be more proud of all of them. Ansonia outhit its opponent with 13 hits compared to five for Greenville. Meghan Brown led the Tigers offense going 3-for-4 with an RBI and a run scored. Kinsey Hartzell also was 3-for-4, while Aubrey Noggler and Abby Shaner had two hits apiece. Shaner also had an RBI for Ansonia, as did Denay Geesaman. For Greenville, Swisshelm had the big bat going 3-for-3 with a double and three RBIs. Sage Fellers and Skylar Fletcher each had a hit as well for Greenville. The Daily Advocate sports editor Skip Weaver can be reached at (937) 569-4316 or by email at sweaver@aimmediamidwest.com. You can follow him on Twitter at @skipweaver65.